When I say touring exhibitions I mean an exhibition that travels to different venues. Not going on a tour of exhibitions myself! What makes a touring exhibition good? For me its a strong theme so you know there is content relevant to your interests. Also the opportunity to see a show that you would normally have to travel a long way to see or simply not be able to get to. If a touring exhibition has related objects from the host museum’s collection that’s another draw for me. A bit like get an unexpected treat! A range of souvenirs is always a bonus. Admittedly I tend towards fridge magnets because they don’t take up much space. Having a selection of linked books, prints, cards and other items does make finding something easy. An annual treat for myself and a friend is going to the International Wildlife Photographer of the Year exhibition in Bristol. Wildlife photography fans will know this tours around the country. Having this available in Bristol is much closer and cheaper to get to than in London. The show is consistently good both in terms of quality of images and addressing issues affecting wildlife. The photos have enough information on shooting them to give a connection with the photographer and an insight into their thinking. The subject range is broad enough to include contentious issues like pollution, deforestation, poaching and local jobs in conflict with wildlife preservation. And a fine range of souvenirs across the prices range too! Sadly our favourite shot wasn’t available as a fridge magnet. It was there as a framed print at a reasonable price but I managed to resist temptation. This second example is also from Bristol and again it was easy to get to for us. We saw Grayson Perry: The Vanity of Small Differences because we both wanted to see this work and it was easy for us to get there. Having seen the Rake’s Progress at the John Soanes Museum in the past we were keen to see how it inspired Grayson Perry. We found the tapestries both impressive and thought provoking. Seeing this subject addressed nearly 200 years after the original was interesting in itself. What added to the exhibition was a copy of prints of the orignal Rake’s Progress on display to refresh the memory or let visitors discover it for the first time. An addition that I really enjoyed was a display of David Hockney prints also inspired by the orignal. The Hockney sequence added to the exhibition by showing a different modern approach to the subject. It also was a very personal approach unlike the original and unlike Perry’s depiction of the Rake. When there are touring exhibitions where I work the common response is visitors appreciate something different on show. Also an exhibiton no usually associated with our collections is popular. An exmaple of such an exhbiton was Hiroshige from the Ashmolean museum. As described above as host venue some items from RAMM’s collection were included and it meant visitors saw items normally kept in store. Something I’m regularly asked when people find I work in a museum is “how do museums get new objects”?. The answer probably is that it varies. Where there’s a collecting policy the process is transparent but otherwise an enigma inside a mystery. On visiting the National Army Museum in Stockholm in early September 2017 I saw their exhibition dedicated to explaining this mystery. The Army Museum’s exhibition was in their temporary exhibition space on the ground floor. I liked the focus on objects for visitors to reflect on and practical examples. Also the emphasis on who made decisions. A key part of the exhibition was an infographic showing the path an object follows to join the collection. Unfortunately this was in a shadow so whilst legible in the museum didn’t photograph well. This was supported by another display explaining who makes the decisions. This display was very honest about the influence of individuals and groups on collecting policy. It stated that in the museum’s early days former soldiers were making the decisions but now it’s mainly highly educated middle class people. An example of new objects was based around items used by an officer in the former Yugoslavia in the 1990s. Most items were conserved ready to go into the collection. One item was not and this was the shipping crate the officer had lived in. Why was it rejected? Because it wasn’t the actual container the officer used but one the shipping company sent. So a good example of an object being rejected because of a lack of direct association with the museum’s purpose and lacking heritage authenticity. While exploring Hove museum I was really impressed by the two galleries dedicated to their optical toys, devices, film and cinema collection. A great mix of stories, machines, objects and historic films playing in a tiny cinema. Part of this collection includes magic lantern slides and a fine selection of projectors. At work (Royal Albert Memorial Museum & Art Gallery) there’s a research project about the museum’s magic lantern slide collection. The A Million Pictures project is international in scope involving museums and universities. Part of this includes digitising and adding the slides to the museum’s database and collections website. Being involved in this project kindled an interest in magic lantern slides as social history and as objects in their own right. Assisting my more learned colleagues with slide shows at museum events added fuel to the fire. Thinking of fuel we used an electric light rather than anything more inflammable and exciting. From this my interest in both slides and projectors has grown. Finding a gallery with lots of magic lantern slides related content was a lovely surprise. There were full size projectors along with smaller ones for home use and even toy ones. A two lens (biunial) projector from the 1870s was very impressive. The brass was gleaming and the wood glowing with polish. A later projector was displayed with its case and accessories showing how bulky these were. By way of contrast small projectors for home use and toy projectors were displayed, These also had slide mounts and strips of images with them. The strips of images often had amusing images for home entertainment on. There is also an impressive backlit wall of slides to give an idea of the variety of subjects found. I didn’t look at every one but could have happily done so! 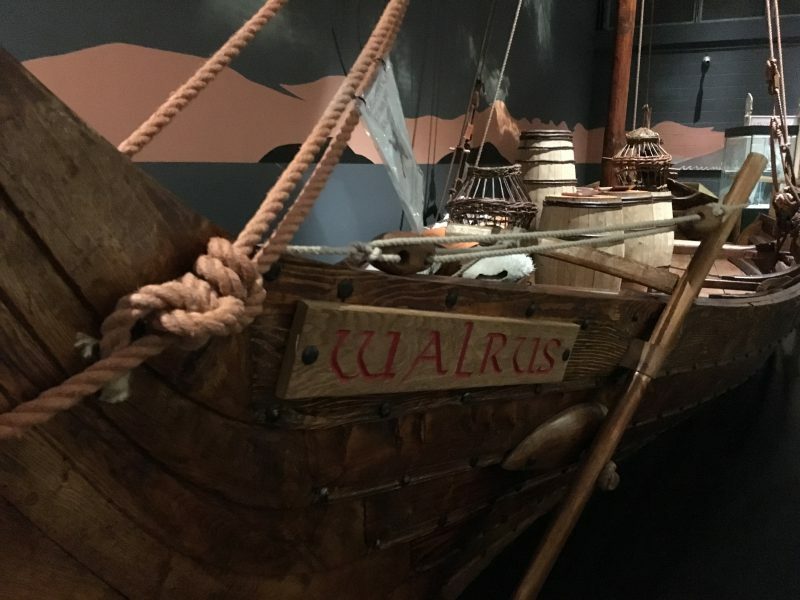 My longstanding interest in the Vikings whether historical or in miniature meant the Vikings exhibition at the NMMC in Falmouth was a must see! Because of the distance it meant little time to see the rest of the museum although we found time for the cafe funnily enough. Walking through the museum I did like the Viking inspired decoration of the learning area. Most people think of the raids on the North East coast, York and Alfred burning the cakes when Vikings are mentioned. However, they really got around and that included Devon and Cornwall. The Great Army burnt down Exmouth in Devon where I live and some residents think they should do so again! In Cornwall there is evidence of settlement and trading which the exhibition included. The combination of interpretation, reconstruction and objects really brought this out clearly I thought. Vikings – raiders or traders? This argument has a long history and I’ve encountered it since university days in the late 1970s. Coincidently this same argument applies to the Homeric world of the Iliad and Odyssey which I studied in the context of ancient banditry but that’s one for another blog. I liked the way the exhibition clearly brought out both sides of Viking life. The combination of the large clear interpretation panels and related objects was excellent. Being able to handle objects was good too. My mother was amazed at the weight of a mail shirt and said being able to touch it really helped imagine it in use. Including weapons and slave fetters illustrated the dark side of Viking life. Backed up with DNA research showing how many Icelanders are descended from Irish women taken as slaves. The Irish connection was well documented in the exhibition too. 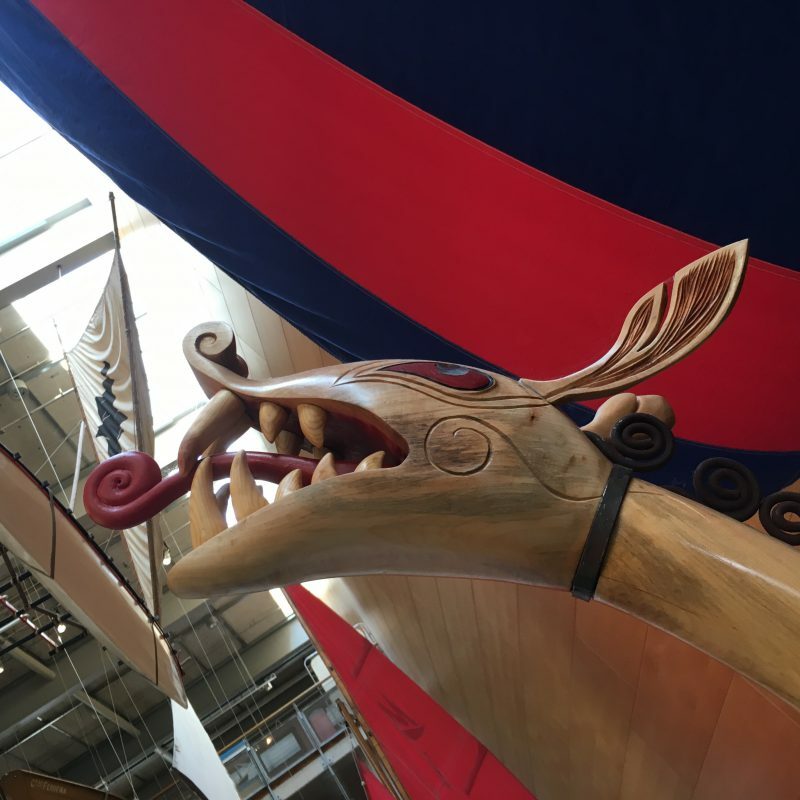 My favourite part of the exhibition was the recreated Viking trader the Walrus. Visitors are allowed on this boat which was both fun and informative. Moving about on the deckspace really made both of us appreciate the skill and courage needed for sailing shallow draft ships on the high seas. Speaking with a well informed volunteer about how the ship was made at the NMMC and finding out more about some of the recreated objects was really interesting. 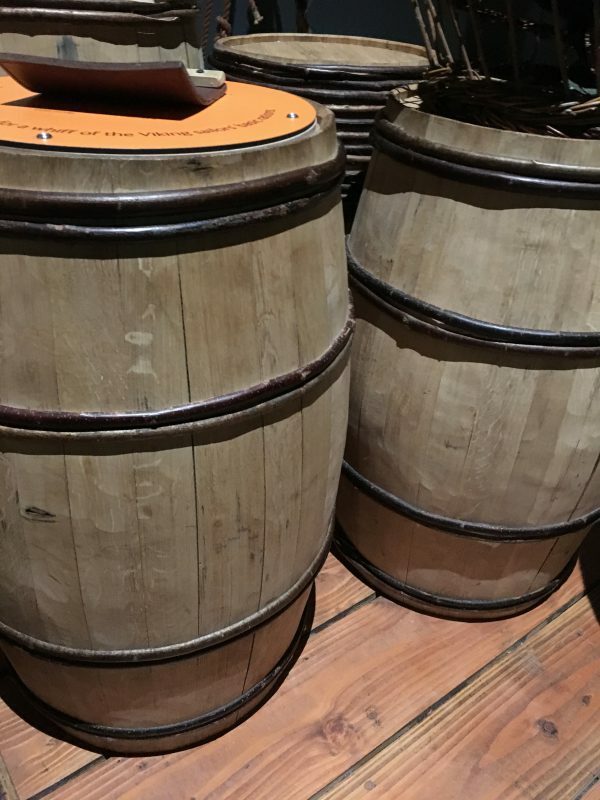 I didn’t know that the Vikings used hazel as barrel hoops which makes perfect sense in terms of time and resources. After all splitting hazel is quicker and cheaper than making iron hoops. How the Vikings made things was a really strong theme in the exhibition. From nails for ships to rigging from intestines there was enough information to appreciate how preindustrial societies relied on skills, crafts, time and effort. I also learnt that saws were not used but a broad headed axe provided a means of splitting wood into planks. No, not some form of dark undead from the Sagas but women and children. Another strength of the exhibition was including women and children in the interpretation and the objects on display. A lovely object was a child’s toy boat and imaging it being played with really brought the past closer. 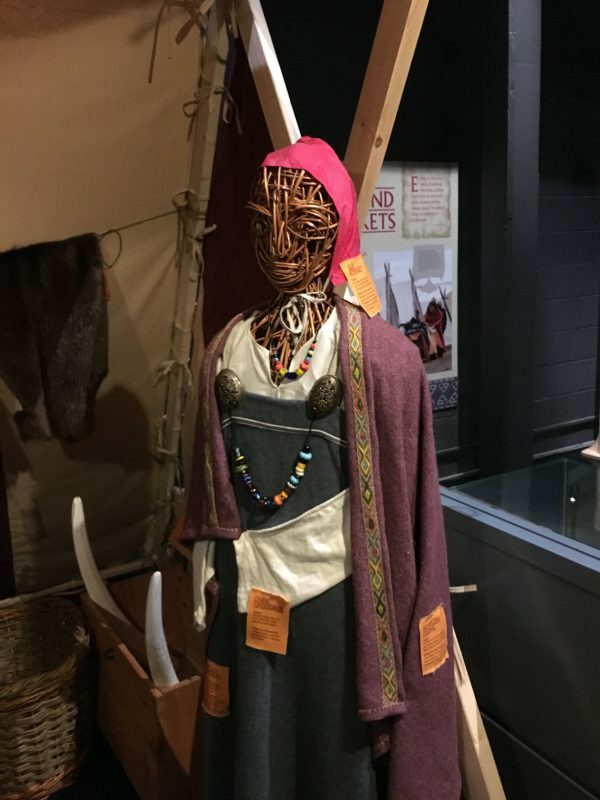 Having a reconstructed trader’s booth with a female mannequin was a nice bit of trading interpretation. The clothes worn were plainer than often shown which seems sensible as the cost of fine clothes with tablet stitch decoration would make plainer working clothes more practical. 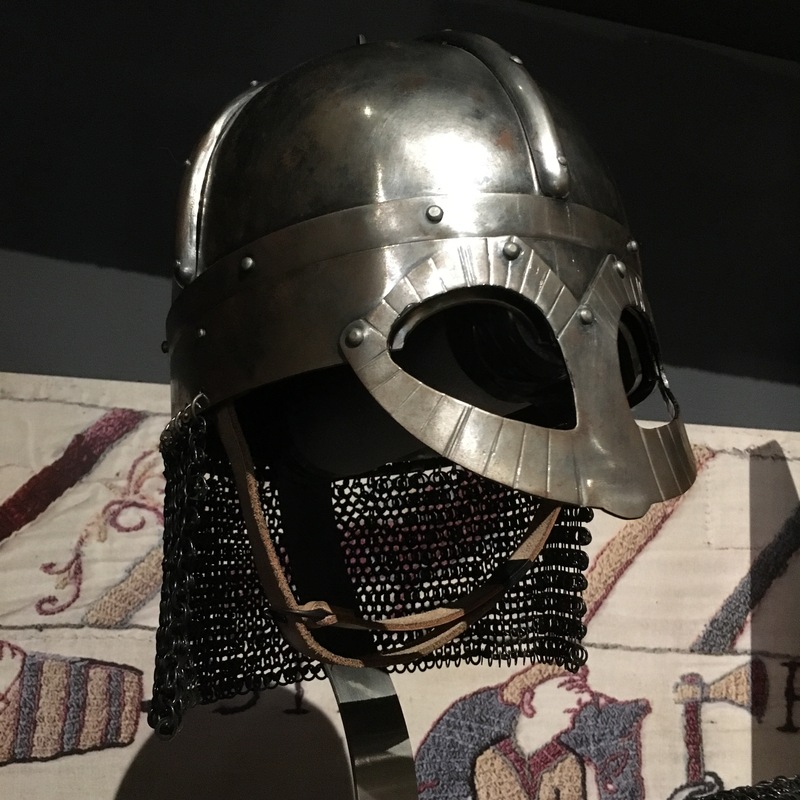 I enjoyed the display of modern items inspired by the Vikings. Everything from films to comics, toys to the Rover badge. A good assortment of souvenirs were in the shop although I didn’t buy anything. Most of the items were very reasonably priced as well which is always good to see. 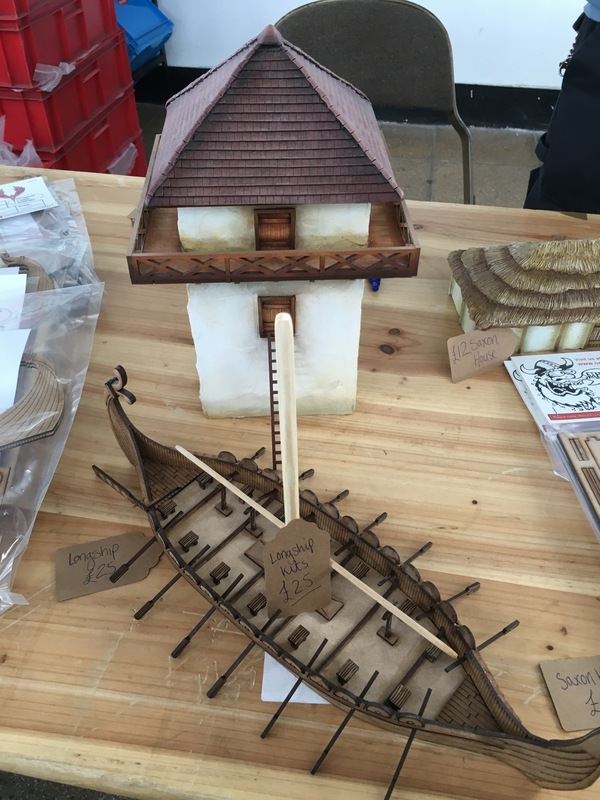 By odd coincidence a week after visiting the exhibition I was at Legionary, the Exeter Games Show, talking to a friend and a trader about Viking ships.